Near Izmir, Turkey are the ruins of the Basilica of St. John, one of the most important churches of the Middle Ages, famous for its miracle-bestowing grave dust. Early in the history of Christianity, a grave on a hillside about 2 miles northeast of the then-important city of Ephesus was identified with a Christian writer named John, believed to be the author of Revelation. The faithful began assuming that the same person was John, the beloved disciple of Jesus, and that he had also written the Gospel of John and the three biblical letters of John. Based on those assumptions, fourth-century Christians erected a small chapel over the grave dedicated to John the Theologian. New stories soon circulated about the grave and its occupant. The most prevalent story was that John was not really dead and his breathing caused the grave to emit dust called “manna.” Pilgrims flocked to the site to obtain containers of manna, claimed to do everything from calming stormy seas to assisting women in childbirth. In the sixth century, Byzantine Emperor Justinian ordered construction of a monumental new church on the site to accommodate the crowds. The brick-and-stone church, in the shape of a cross, featured six domes, the central one directly above the grave and supported on four columns. 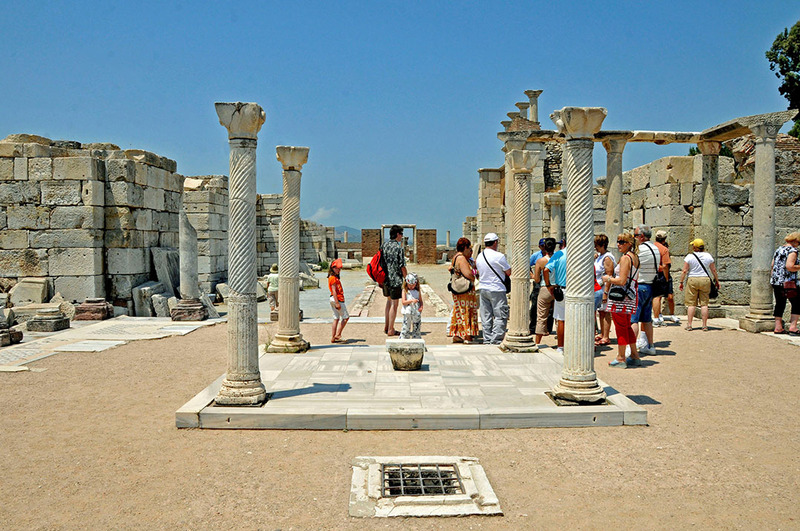 The Basilica of St. John opened in 565 A.D.
After the Turks conquered Ephesus in 1304, the Basilica of St. John was used as a mosque until it was destroyed. Materials scavenged from the ruins were then used in building the Isa Bey (Mr. Jesus) Mosque immediately downhill from the church. Today, the Basilica of St. John has been partially restored, giving visitors a sense of the size of the building, which, if totally rebuilt, would reportedly be the seventh-largest church in the world.